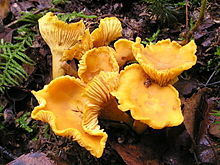 꾀꼬리버섯(Cantharellus cibarius)은 버섯류의 하나이다. 살구 냄새가 나서 살구버섯으로도 부른다. 꾀꼬리버섯과 전체로 보지 않을 경우, 꾀꼬리버섯속에서는 가장 잘 알려진 종이다. 노랗거나 귤색을 띄고 살구향을 내며 깔때기 모양을 하고 있다. 훌륭한 식용 버섯으로 간주된다. 꾀꼬리버섯은 유럽 북부, 멕시코를 포함한 북아메리카, 터키를 포함한 아시아, 히말라야 산맥(카슈미르, 네팔, 부탄 포함), 콩고, 우간다, 잠비아를 포함한 아프리카에 흔하다. 꾀꼬리버섯은 비타민 C가 상대적으로 많고(0.4 mg/g 생체중), 칼륨이 매우 많으며(약 0.5%, 생체중), 212 IU/100 그램 생체중에 이르는 에르고칼시페롤(비타민 D2)과 더불어 비타민 D 최고의 원천 가운데 하나이다. 위키문헌에 1911년 브리태니커 백과사전 글 Chantarelle의 본문이 있습니다. ↑ Dar GH, Bhagat RC, Khan MA (2002). 《Biodiversity of the Kashmir Himalaya》. Anmol Publications PVT. LTD. ISBN 978-81-261-1117-6. ↑ Boa ER. (2004). 《Wild Edible Fungi: A Global Overview Of Their Use And Importance To People (Non-Wood Forest Products)》. Food & Agriculture Organization of the UN. ISBN 92-5-105157-7. ↑ Barros L; Venturini BA; Baptista P; Estevinho LM; Ferreira ICFR. (2008). “Chemical composition and biological properties of Portuguese wild mushrooms: a comprehensive study”. 《Journal of Agricultural and Food Chemistry》 56 (10): 3856–62. PMID 18435539. doi:10.1021/jf8003114.